In this entrancing novel “that speaks to the Marilyn Monroe and Elizabeth Taylor in us all” (Kirkus Reviews), a legendary film actress reflects on her relentless rise to the top and the risks she took, the loves she lost, and the long-held secrets the public could never imagine. Taylor Jenkins Reid lives in Los Angeles and is the acclaimed author of Daisy Jones & the Six, The Seven Husbands of Evelyn Hugo, One True Loves, Maybe in Another Life, After I Do, and Forever, Interrupted. To learn more, visit TaylorJenkinsReid.com. "A novel of Old Hollywood that's simultaneously gossipy and poignant. Look no further for the glamour, ambition and shocking secrets your beach-blanket sessions demand." "In her mesmerizing tale, Taylor Jenkins Reid explores Hollywood’s heyday with a heroine akin to Elizabeth Taylor. Movie icon Evelyn Hugo, now a recluse at 79, unfurls the story of her glamorous life and her scandalous seven marriages." "[The Seven Husbands of Evelyn Hugo] is fascinating, emotional and will be hard to put down. For fans of Taylor Jenkins Reid, this is her best work yet." "A spellbinding novel about love, glamour and the price of fame." "In her latest mesmerizing tale, Reid transports readers back to Hollywood’s heyday with a heroine in the likes of — but more intriguing than — Elizabeth Taylor, Zsa Zsa Gabor and Katherine Hepburn. Yes, Evelyn Hugo is the glamorous idol you admire, but she’s also the relentless fighter you aspire to be. Her life’s story is heartbreaking, yet beautiful and will keep readers captivated until the very last page." "Reid’s characters will enchant readers as they travel through the glitz and glamour of Old Hollywood and the truths they both must confront." "Addictive, dazzling and bound to leave you in tears (classic Taylor Jenkins Reid), The Seven Husbands of Evelyn Hugo should be your No. 1 reading priority this summer." "This sweeping tale is about an aging Hollywood starlet and the rookie magazine reporter she hires to pen her breathtaking (and scandalous) life story. Trust us: You’ll be swooning over the twist for months." "Evelyn Hugo is a character who can demand top billing...Reid's heroine reveals her darkest secrets as if she were wiping off makeup at the end of the night—a celebration of human frailty that speaks to the Marilyn Monroe and Elizabeth Taylor in us all." 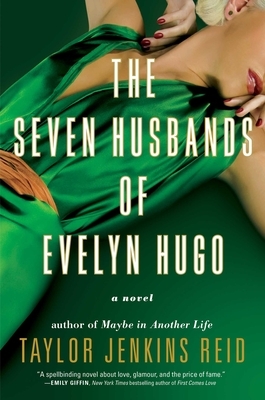 "The Seven Husbands of Evelyn Hugo has big, juicy secrets at its heart-- not just about the surprising identity of movie star Evelyn Hugo's true love, but of the lengths she has gone to protect that mysterious lover. Brimming with heartache, betrayal, and a lifetime of Hollywood gossip, this raucous novel will seduce you even as it leaves you wanting more." "A glamorous romp through Hollywood in its heyday, Taylor Jenkins Reid’s latest offers up several unexpected twists and a dazzling, ambitious movie star who will break your heart." "Evelyn Hugo makes Liz Taylor seem pedestrian. Taylor Jenkins Reid has drawn a rich, emotionally complex heroine who is so real that you'll forget she only lives in the pages of a book. This is an utterly compelling dance with love and tragedy, sometimes both at once; you'll laugh with Evelyn, cry with her, ache with her, and then go back to page one and do it all over again."